Is there a more transfixing and awe inspiring thing to behold than a night sky? A blanket of brilliant, twinkling stars embedded in an inky black stratosphere is one of Mother Nature’s greatest gifts. 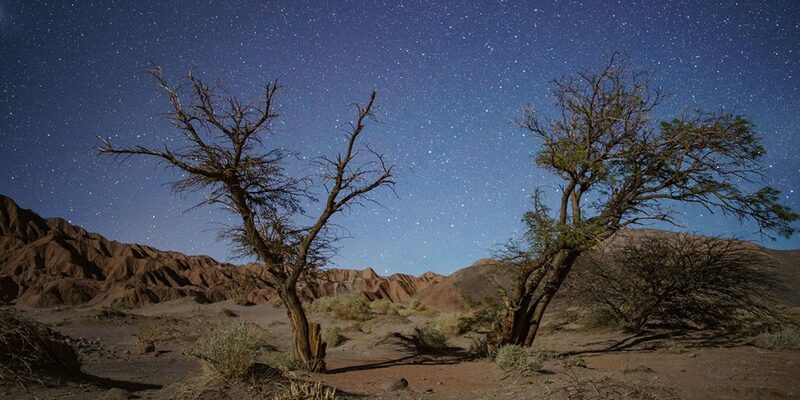 It is said that the Atacama Desert in Chile is one of the best places on this planet to view this celestial extravaganza and we must be forever grateful that Canadian Filmmaker, Alison McAlpine, has taken up shop and cameras there and gave us the visually stunning documentary CIELO. More than just a planetarium lightshow, CIELO explains how the night sky affects the many people who reside or work in the Atacama Desert. Scientists and astronomers who work at the observatories relish in their tales of discovering new planets. Even more fascinating are the desert dwellers who work the land, basically isolated from hustle and bustle that most of us reside in. The stories they share are endlessly fascinating. One married couple argue about gravity and whether the earth is flat. Others focus on spirituality and mysticism. To say more would require spoiler alerts! But the true star of CIELO is the night sky and the Cinematography is outstanding and literally mind-blowing. Shooting stars illuminate the darkness. The vastness of the universe is inspiring. My one quibble with CIELO is that feels padded. It is only 79 minutes long but it feels that scenes were added just for the sake of a theatrical release. It’s a minor complaint that dissipates when one takes into account that McAlpine has taken you to a place that you would never see and are better for it. It must be seen on a big screen for the full breathtaking experience. CIELO opens at the TIFF Bell Lightbox on August 10, 2018.